There have been two space-related stories of note in the news recently. 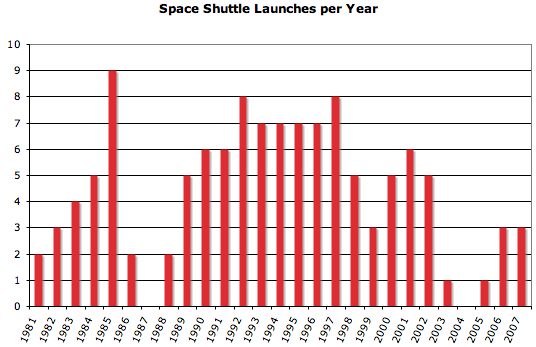 NASA was accelerating launches through the start of 1986, when Challenger was destroyed. The first period represents the hopes and dreams of the shuttle program. Before Challenger, it really might have made space travel routine. The middle segment, from Challenger to Columbia, is the long working life of the shuttle. Expectations were capped, and so were results. The shuttle program should have ended after Columbia. But instead, it gets a third period to die of old age. Shuttle missions these days primarily service the International Space Station, which exists primarily to give the Space Shuttle somewhere to go. Seriously, try reading the wiki article about the Columbus module being installed on the next shuttle mission and tell me what exactly it does. Hubble Space Telescope maintenance is often pointed to as something worthwhile that the Shuttle does. Fair enough. But how many Hubble’s could we have had for $145 billion? The second story is genuinely exciting. It comes from the European Space Agency’s CoRoT mission. At $50 million, it’s a featherweight space mission. This telescope was launched last December and has been observing stars for the past year, looking for transits. This week, they reported that “CoRoT is discovering exo-planets at a rate only set by the available resources to follow up the detections”. This is completely nuts! There are currently 268 known exoplanets. It’s possible that this number will double in the next month as the CoRoT group begins publishing their findings on December 20. Personally, I’d consider that a more significant achievement than anything the Space Shuttle has done in the last 25 years with its $145 billion.